[Jkx] was using a Thomson VS360U video transmitter to make a wireless connection between a cable box and his television. The system using an RF remote, but relies on an IR transmitter to communicate between the base station and the cable box. He found the IR module that comes with the device is under-powered and set out to fix the situation. Using a scope he found the pin that drives the IR LED. 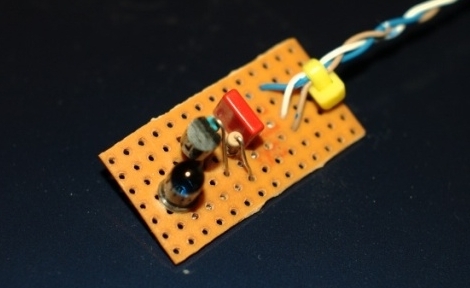 The board above contains a boost circuit that patches into voltage and ground, using the pin he sniffed out to control the base of a transistor. Now the device has enough power to reliably control the cable box. What, no lasers? Seriously though this is a simple and elegant solution. Well, perf board is about as elegant as *I* get. Well done! I love those simple hacks ! Why patch into the IC circiuits and connect them trough a satelite (okay sounds way more cool…) if you just can do something like this? Reminds me of the Canon IR release i made. Sweet and Simple, I like it. Great hack, I might end up using something similar to this for my TV system back home. :D thats exactly how i feel. The 547 was the first transistor i had in my hands. Small and fancy thing. I’m even feeling bad about using an another one for my Canon IR remote…but it was necessary, because i wanted to drive the LED with the 120mA, which were written in the datasheet and i was afraid that the 547 would get too warm. But maybe i can still use it, because the LED is being controlled with pulses and doesn’t draw continuous current. @nomad: if you have your heart set on the BC547, considering this is a digital application couldn’t you just parallel a few of them? OMG instead of buying more coax he come up with this? Love it! Nice comments people! What he doesn’t go into on the site which may be of news to some people is that LEDs die because of thermal runaway. Thus if you have an LED that can safely run at 25mA there’s no reason why you couldn’t pulse it quickly at 100mA providing there’s enough of a gap between pulses to cool down. Parallel a couple of these LEDs and their driver circuits, add a slightly beefier transistor and drop the resistor to 10ohms and you’d be able to get this thing working across a football field. Just pay attention to the datasheet of the LED to see if there is any hard upper limit to current, and if you’re ever in doubt if the LED still works, just drop your phone into camera mode and look at the LED through the eyes of the crappy little IR recording CCD in your cameraphone. I’ve read that summary 3 or 4 times and I still don’t understand what it says. Great hack. Now I just wish there was a simple way to boost the video transmission signal power! @andrew: you don’t have to care about the current on IR-LEDs, because they can handle a current up to 120mA, which sure is more than the maximum of a “normal” LED. Especially if you want to use a BC547, because its maximum is about 100mA. The second fact of IR systems is, they always are running with pulses. E.g. the Canon IR protocol runs on a frequency of 36kHz. oh i noticed i wrote andrew when i actually meant Garbz…sry about that. Awesome, im fully gonna do this to my kids new set if IR Rokenbok toys! men i enjoyed what you did with the ir transmiter thing. can you post the schematic along with it,pls.